Just read Rob Drieslein’s blog about prime walleye fishing in June, and I couldn’t agree more. I enjoy fine fishing during the entire open-water season, but I agree with Rob’s premise that June fishing is a can’t-miss month to be on the water. Allow me to focus on another species in this space, however: bass. In my last blog, I broke down the basics of wacky rigging. Since filing that piece, we’ve hit several south metro Twin Cities lakes and enjoyed excellent bass fishing this spring and early summer. Last weekend, by mostly working wacky rigs, I caught and released at a minimum 30-plus bass on two different lakes during an aggressive bite. 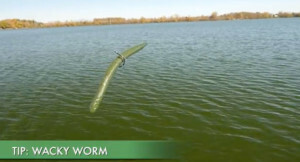 Use a wacky worm that runs 5 to 6 inches long. I like mine with more bulk in the center part of the body to accommodate my “wacky” or jig hook. We want the right mass to allow for a long cast but still offering a slow drop. It’s important that each end have flutter action. Quite often, our strikes will come on the drop with this setup, but also via simple deadsticking or the always-effective lift-drop method. To scent enhance or not to scent enhance? I generally err on using scented versions with most of my plastics. They camouflage unnatural odors, and in my experience fish will hold onto scented lures longer. I see a lot of anglers place too much action into their wacky rigging. That’s unnecessary because a properly rigged wacky setup produces a unique action all its own. I’ll occasionally give the line a pop to take up my slack while retrieving, but less usually is more with this presentation. The most common colors you’ll see for wacky worms are green pumpkin, watermelon, pumpkinseed, and black and blues. When using darker colors, I like some red flecks in the plastic to add a spark of flash. 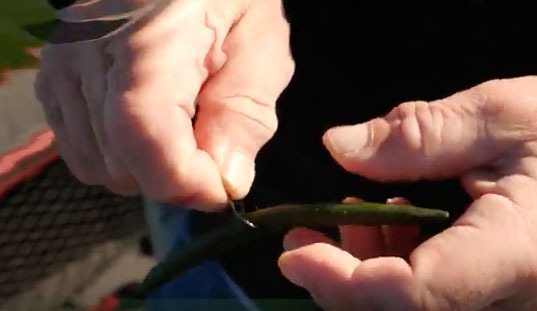 This technique will work the entire open water season, so experiment with it along weedlines, breaklines, riprap, and openings and gaps in thick vegetation. It’s great fun!